We have been receiving a few IMs from people wishing to reprise roles and roleplays which existed in the last Golgothica. 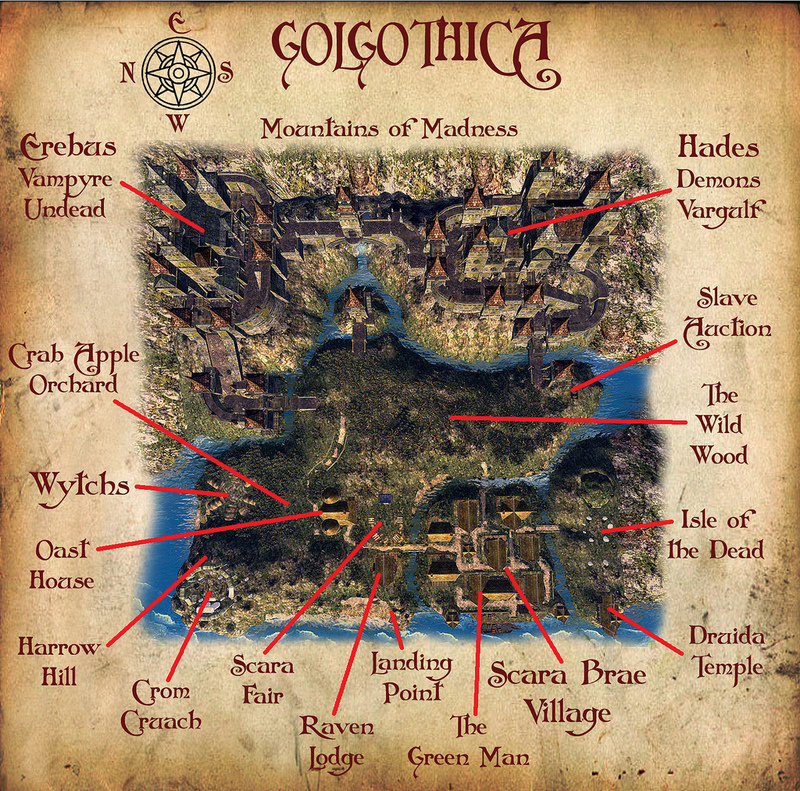 We feel we should warn all players that the new Golgothica has NO CONNECTIONS AT ALL in either storyline or game play to the old Golgothica. The New Golgothica is also NOT CONNECTED TO KOS. This is not a re opening, this is an ALL NEW SIM giving us a chance to try out some new, at least for us, ideas. The Sim is a COMPLETE RE BUILD with only the very basic layout of 2 castles and a village remaining from the old Build. There are hundreds of new sculpts and thousands of new textures. And most importantly, a new type of game play for us. Of course we do not wish to stop players role playing their characters in whichever way they please. In fact we wish to give people even more licence than we have done in the past to do their own thing in their own way. There is no overbearing storyline telling people how to play their roles or boxing in your character, you want to be a Demon from the ninth level of hell, grandson of Satan himself ? or a Masquerade Vampire with ancient lineage ported over from some other game? then please feel free to do so. All you need do is fit your currant storyline into what you see around you. And of course your play should be based around the new sim rules and objectives. Most importantly, this is a CARP sim pure and simple. All other game elements are fun ideas to back up this play and keep it interesting. Here you are either Master/Mistress or slave/Captive, Dom or Sub. There are no heroic avengers or police or knights here, beating up on the ruling Elite. There is still combat, but it is very optional, and it is definitely not the Raison d’être for a players existence here. We have decided to go with the adult rating on this one and we do not intend wasting the supposed opportunity and benefits of extra freedom that this this gives us to be gross and OTT when we feel like it. By far the most important element of SL is still the freedom we have here to do as we please, unlike most other commercial on line games and worlds.. This freedom cannot last forever, so we hope to make the best of it while we can. There is a new Map of the sim here. Regular players will find quite a few major changes to the SGS game system in this new version. The majority of these changes have been made based on the feedback we have received over the past year. In general they are to do with improving the system through simplification. Weapons are of 4 types: regular, low-damage, capture or tools. Preys can now use low-damage weapons in defense. Bumping as a method of capture has been removed. Capture weapons will be used instead. Some groups/races can be defaulted by us to be ‘Prey’ or ‘Predator’ and you cannot change that. Check on the webpages to see which ones. You can minimize the HUD by clicking on the top-left button. All items are now ‘virtual’ and stored in the SGS database. Items can be either sold with the gesture “/sell”, or used with the gesture “/use”. Based on your level of skill, you will get 1, 2, or 3 items for each time you signup. Added ‘blood’ skill items as well. Max 20 items in inventory. Expiration is 2-3 days for all of them. Stamina will automatically increase when your avatar rests. Running, jumping, swinging a weapon etc will decrease your stamina during fight/capture. If stamina is zero, then your avatar will freeze and stop for a few seconds. When you stop, then the stamina goes up again, and you will start to recover. Max stamina is assigned to each group (prey groups may have less stamina than predator groups. Find out on the website). You won’t be able to eat or heal when your stamina is below a certain level (to avoid quick healing during combat/capture). The meter is really a collar now. There are different version of collars, but at the moment we released a gothic version, one for Females, one for Males. No more cylinder shaped meter (that was still causing some confusion). You can now vote for the next Head of Metropol. The candidates are: Kal Villota, Loki Alphaville, Belinda Lefavre, Caleb Baguier, Raiden Netizen, Julianne Lemondrop. Any citizen of Nomos may vote. Minimum 7 game day old. Please release your campaign/statement to the press (“The Street Life”). And you can use sign/posters as well or notecard. Voters may change their vote. The next vote will overwrite the previous vote. Who is going to be the next Ireem Mystic? Please make your choice. Any Ireem Resident may vote, and should vote. The voting board is next to the Mystic Store. The candidates are: Frederik Yalin, Cheryl Oh, Merum Wind, Lola Kristan, Keezie Serpente, Briana Firehawk, zoe Eyre. Candidates may promote themselves in any way they deem appropriate (article on the paper, signs, notecards, etc). Voting will likely take 2 rounds . First round ends next Sunday. xylimer Clarence has been elected as Harem Master by the majority of the Palace Staff and Harem Slaves and Staff. Are you in an argument? Armwrestle for it. Did you get into an argument and want an alternative way to solve the issue? Come and arm wrestle in the tower (just crossing the border with KOS2). Since several people asked for it, to be fair I think we can run a bit of popularity contest. If you are interested signup for it, and become a candidate, then people of Ireem will vote. The Mystic has now a tarot table. Candidacy is open until end of the week. I have been asked this question, so here is the answer. A knight in disguise is equivalent to an off-duty ‘police officer’ in a way. Although he is probably dressed up in normal clothing and his behavior may be a little more loose, a knight is still a knight. If he witnesses a crime , he may intervene, or he may not. Up to the knight really. Howver, unless you personally met him and recognize him, you will not know that he is a knight unless he identifies himself as such. We will run democratic election to nominate a new Head of Metropol. If you are interested in the position, please sign up as candidate in the Election Register located at the Metropol reception area. Candidates are expected to submit a statement or equivalent to the local press to promote their IC campaign. Candidacy are open until the end of the week. I just want to remind you that if you commit crimes, you do agree in getting captured for your crimes and pay for them. When you commit crimes and you are in the wanted list (you have ‘new crimes’ in your profiles). you may be arrested anywhere in the sim (city or not). The only exception is your group safezone, where you have an advantage, but anywhere else, you must behave like you are a wanted criminal. It would be silly otherwise. If you then are innocent, go to trial and prove it to the jury. Candidates are: xylimer Clarence , Jamal Tremmor, Markella Orchid, Aethos Resident, LADYAKIRE Resident, Dolorific Resident, ninxy Hansen, kijani Scorpio, Renickor Dartmouth, Azriel Mathilde, and Nobody (to choose NOT to have any master). You can make your selection now. Palace and Harem Inhabitants are the only ones allowed to vote. Voting will close on Wednesday evening. Vote costs 20G$. One round of vote only (unless there is an almost tie). We don’t accept any more candidates. Current candidates are: xylimer Clarence, Jamal Tremmor, Markella Orchid, Aethos Resident, LADYAKIRE Resident, Dolorific Resident, ninxy Hansen, kijani Scorpio, Renickor Dartmouth, Azriel Mathilde. If you are in this list or member of the Palace/Harem, please show up at the Palace today at 2:30pm for a first round interview with the candidates.